The McDonalds company has a wide range of loyal customers. Many people feel as if they grew up with McDonald’s. People trust the company, and the McDonald’s concept just seems to make people feel good. That’s why their customers are rich, poor, old, young, black, white, Asian, and European. Though many of McDonalds competitors are also successful, they are no match for the giant franchise. Making existing and potential customers knowledgeable about products/services, consumer awareness creates more informed buying decisions. Consumers cannot purchase products and services if they do not know they exist. That being said, I believe McDonalds does uphold the basic rights of consumers. Currently, McDonalds displays nutrition facts on all of their food items. That was not always the case. Prior to the movie super size me, and the ensuing lawsuits, McDonalds would offer consumers the option to upgrade their already unhealthy meals to a even larger potion known as super size. This ignored consumer rights because the establishment did not warn customers that they would be consuming nearly half of their daily calories just by having fries. Appropriately, McDonalds no longer tries to gear people towards the unhealthy option of super size and displays nutrition information on all of its products. Therefore it is fitting to state that the major rights of consumers have not always been upheld at McDonalds, but they are taking steps in the right directions. At present, they are making phenomenal strides toward a healthier menu. McDonald’s started giving customers the option of choosing apple slices and milk as part of the Happy Meal package. They also began packaging 100-calorie versions of Oreos, Wheat Thins and other healthy treats. Also McDonalds is currently working on removing trans fats from their food. More and more McDonalds is taking gradual steps to making the American consumer more responsible for what they put in their own mouths.Soon, it is very likely that people will no longer be able to blame corporations like McDonalds for obesity because there will be healthy options and people will be informed. Moreover, some believe that large food corporations, like McDonalds, should claim responsibility for obesity in the United States. The arguments for and against the proposition that the food and restaurant industries should be held liable for the rise of obesity in the United States are as follows. In his opinion dismissing the original lawsuit, the judge said that legal consequences should not attach to the consumption of hamburgers and other fast-food fare unless consumers are unaware of the dangers of eating such food. 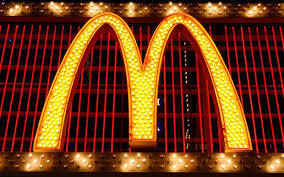 However, Sweet said plaintiffs argue that McDonald’s products have been so altered that “their unhealthy attributes are now outside the ken of the average reasonable consumer.” For instance, Sweet called Chicken McNuggets a “McFrankenstein creation of various elements not utilized by the home cook.” Also people argue that the flashy advertising and fun cartoon characters have a addicting effect on Americas youth. Creations such as the “happy-meal” and Ronald McDonald make people nostalgic for McDonalds because they remember it from their youth. Alternatively, some people argue that food corporations are not responsible for obesity in the united states. For example, if a business provides adequate information about its food products, even it is obvious. Then they have fulfilled their ethical obligation. Also when you provided information consumers are less likely to seek restitution through litigation. Another reason they are not responsible is because fast-food companies have been modifying their marketing, to improve the availability of nutritional information, and add healthier options to the menu. In Terms of McDonald a relevance consumer protection agencies include the FDA, the food and drug administration, as well as the FTC, the federal trade commission, All case concerning consumer protection are general mediated or handled through them on some level. Obesity has become an epidemic and an important public health concern. Because the problem is multidimensional, the solution will require an interdisciplinary approach involving the cooperation of the food industry with other stakeholders, such as the government, academia, and health care providers. The consumer is an important player in the solution to obesity because the consumer can make healthy lifestyle choices at the individual level. The food industry is committed to providing the consumer with healthy food options and reliable nutrition information. Obesity is a multifaceted health issue that involves biological, behavioral, and environmental sources. Energy imbalance sits at the core of the obesity problem, because weight gain results from consuming more calories than one expends. In America, a changing environment has increased food choices and changed eating habits. Many Americans are sedentary: more than “one-half of US adults do not meet recommended levels of moderate physical activity”, and “one-fourth engage in no leisure time physical activity”. Therefore it is not just the responsibility of the food industry to provided healthy choices, but the tandem of the healthy options and a self-commitment to living a healthy life that will make America less obese. The government plays an important role too close harmony between the food industry and other important stakeholders within the obesity epidemic, such as the government, academia, and health care providers is imperative. The government can help educate consumers to make healthier choices through food labeling, physical activity endorsement, and the support of community-based programs. The food industry should cooperate with the government to guarantee the production and availability of low-calorie, nutritious foods. This can be achieved by providing incentives to industry and also stimulating media participation in the prevention of obesity. The government should develop and support new food technology and improve communication across responsible parties and consumers. Scientists also have a unique insight to provide scientific data influencing the decisions of industry and consumers. Research scientists can work together with the food industry to generate nutritious foods and to promote reliable, science-based nutrition information. Academic institutions also play a key role in educating health care professionals, who will educate their patients and our consumers. The medical community is uniquely positioned and trusted by consumers, because consumers look for nutritional advice from knowledgeable and trustworthy professionals. Health care providers can encourage consumers to make individual lifestyle changes that will improve their health. The health care professional, in assuming such a role, can transform their interaction on this topic from clinical resolution to thoughtful prevention, thus helping consumers develop and reinforce strategies for eating and physical activity that reduce overall individual health care risk. Lastly, McDonald’s Stakeholder are its consumers. In the past McDonalds has turned a blind eye to the issue of obesity in America, but is now making tremendous ground. McDonald’s has a bright future because they make a consistent effort to keep up with health trends in America. In conclusion, food corporations such as McDonalds play a big role in the size of American people. However, they are not the only factor. The only way to have a healthy society is for all the components of society to come together and do their part.